Inter-American Institute for Global Change Research (IAI), United Nations Development Programme (UNDP) in collaboration with Argentina, Dominican Republic and Cousteau Society. The Government of Belize together with its partners - the Environmental Defense Fund and the Nature Conservancy - will showcase a dynamic strategy for ecosystem based fisheries management that combines marine tenure, harvest control, protected areas, the empowerment of fisher folks and multi-stakeholder partnerships towards the advancement of sustainable small scale fisheries. The side event will demonstrate effective approaches for science policy interface, empowering women in the fisheries sector, leveraging finance and markets to reinforce good management, and the lessons learnt from co-management and community based management for fisheries governance. Healers of our Ocean: Asia-Pacific women leading ocean action to achieve SDG14 â€“ how can we learn from them? Ocean acidification: what can we do about it? Market based measures like certification provide powerful incentives for the sustainable use of marine resources. But the fast proliferation of eco-certification schemes has led to confusion among users over how to recognize those that deliver genuine impact. Germany, FAO, METRO GROUP, MSC, GSSI, and CEDEPESCA invite you to discuss a sector wide solution to this problem: the Global Sustainable Seafood Initiative (GSSI). World Environment Day: â€˜Connecting People to Natureâ€™, the theme for World Environment Day 2017, implores us to get outdoors and into nature, to appreciate its beauty and its importance, and to take forward the call to protect the Earth that we share. World Environment Day is the biggest annual event for positive environmental action and takes place every 5 June. Canada is this yearâ€™s host country. Marine and coastal ecosystems, which include natural assets such as marine living resources and a range of important habitats or features, such as mangroves, coral reefs, seagrass beds, coastal tidal marshes, seamounts, thermal vents and cold water corals, are crucial for human well-being and sustainable development. They provide humans with food, water, medicines, construction materials, energy, transport, shoreline stabilization, coastline protection and erosion prevention, climate regulation, oxygen production, maintenance of biodiversity, as well as recreation, aesthetic, cultural, religious and spiritual services. Marine and coastal ecosystems act as carbon sinks absorbing annually about one-fourth of the total annual anthropogenic emissions of carbon dioxide.1 They provide a vital basis for the livelihoods of many coastal communities, particularly resource-dependent communities in developing countries. The ecosystem services marine and coastal ecosystems provide have substantial economic value â€“ estimated by studies on the order of trillions of US dollars annually. The UN SIDS Partnership "Learning from the Sharp End of Environmental Uncertainty in SIDS" (the "Sharp End"â€™ partnership) was launched on 2 September 2014 at the Samoa UN SIDS Conference. This side event will highlight work of Sharp End partners and others in supporting research, training and education to develop capacities for sustainable marine livelihoods in SIDSâ€™ coastal communities in the context of the blue economy. With this event Swedish Industry and Public Private Partnership initiatives are presented where the aim is to emphasize the industryâ€™s will and ability to act as a motor in the needed change process to transform into a sustainable world where the seventeen global goals are met and where SDG 14 â€“ saving the oceans â€“ is key in the planetary processes. By showing the diversity in knowledge, and driving forces, we like to demonstrate that the transformation is possible through robust incentives. Going to Scale in the Ocean: from large scale MPAs to whole domain management: ridge to reef to ocean. A wave of change. Changing peopleâ€™s attitude towards single use plastic in a single generation through the film â€œA plastic Oceanâ€�. How to collect marine biodiversity information at low cost? How to transfer cold water methods to tropical conditions? The government of Germany, represented by the German Federal Ministry for Economic Cooperation and Development (BMZ), together with World Wide Fund for Nature (WWF), International Union for the Conservation of Nature (IUCN) and in cooperation with the Global Mangrove Alliance (GMA, initiated by CI, TNC and WWF) organize a side event on mangrove protection efforts as important contribution to the achievement of the SDGS â€“ above all SDG 14. Mangroves are key ecosystems for marine biodiversity, coastal protection and livelihoods of coastal communities. However, the global mangrove cover decreases at alarming rates. Therefore, BMZ, WWF and IUCN start a new Mangrove Initiative. During this launch event leading experts, government representatives and civil society will discuss major challenges and new solutions for mangrove protection. For high level decision-makers and experts on marine and coastal ecosystems, resource management, planning and related fields. Please mark the date in your calendar. An official invitation with information on the registration process and the agenda will follow soon. For inquiries, please contact Ms Julika Tribukait (julika.tribukait@wwf.de). The sustainable development goals are inter-linked and multi-directional. Sustainable use of the oceans is important to eradicate poverty and provide food security and nutrition for all. This is relevant in the following up of the Sustainable Development Goals and the UN declaration <Decade of Action on Nutrition>. Trade in fish-related aspects of SDG 14: What next? The governments of Germany and Sweden, together with the United Nations Environment Programme and in cooperation with the Institute for Advanced Sustainability Studies (IASS), the Institute for Sustainable Development and International Relations (IDDRI), and TMG â€“ Think Tank for Sustainability are organizing a one day side event on the role of regional ocean governance for delivering SDG 14.
science needed to protect our shared ocean. This special high-level reception is being convened by the Executive Secretary of the Convention on Biological Diversity, together with the Government of the Republic of Korea (Ministry of Oceans and Fisheries) and the Government of Costa Rica (Ministry of Environment and Energy). More than 3 billion people rely on fish for an important source of animal protein, and 300 million people rely on marine fisheries for their livelihoods. In developing and developed countries alike, the consumption of fish is increasing both per capita and in absolute terms. Partnership Dialogue 5 addresses two distinct but interrelated targets of SDG 14: increasing the economic benefits to small island developing States (SIDS) and least developed countries (LDCs) from the sustainable use of marine resources, including through sustainable management of fisheries, aquaculture and tourism (14.7); and providing access for small-scale artisanal fishers to marine resources and markets (14.b). A discussion on these topics must include consideration of a range of linked but distinct issues. Oceans provide a wide array of benefits to LDCs and SIDS includingâ€”but not limited toâ€”small-scale, artisanal fisheries. Likewise, small-scale artisanal fishers are a fundamental part of SIDS and coastal LDC societies, but they can also be found in developed and other developing countries.1 Estimates suggest that workers involved in small-scale fisheries comprise over 90 percent of people employed globally in capture fisheries and related activities, and produce approximately half of the global catch. An effective examination of these issues will require a holistic, integrated approach that takes into account not only the diversity inherent in the topics but also the close links to other SDGs. The unifying theme is livelihoodsâ€”primarily from fishing but also from aquaculture, tourism and other ecosystem services. The livelihoods focus of the dialogue means that the discussion can be informed by other SDGs, in particular SDG 1 (eradicate poverty), SDG 2 (end hunger), SDG 5 (gender equality), SDG 12 (sustainable consumption and production), and SDG 13 (combat climate change). There are also close links to the other targets of SDG 14. Marine Protected Areas: SDG Catalyst? Effective ocean governance is essential if ocean ecosystem goods and services are to be sustained for present and future generations. The Governments of Belize and Barbados, the Caribbean Community and the University of the West Indies presents a side event to explore how to strengthen ocean governance at the regional level drawing on lessons learned from regional ocean governance initiatives around the world. The side event will develop concrete recommendations for advancing good oceans governance as a cornerstone of sustainable development. The side event will also serve as a platform to announce the Caribbean Large Marine Ecosystem Plus (CLME +) Partnership, a regional initiative that practically demonstrates how enhanced ocean governance can address the systemic problems impacting CARICOM namely habitat degradation, marine pollution and depletion of fish stocks. Germany, in cooperation with KfW, founded the Blue Action Fund as a response to the funding gap for the conservation of marine biodiversity. The Blue Action Fund supports NGOs in their efforts to conserve oceans and coastlines. This launch event will bring together the major contributors and partners of the Fund. In order to enable informed and effective decision-making and governance of the ocean, international collaboration between ministries and research funding agencies to jointly fund new knowledge generation as well as efficient and effective science-policy mechanisms are of fundamental importance. The objective of this science-policy briefing is to present multilateral processes for providing scientific evidence to support the sustainable development of the oceans, to showcase cutting-edge examples of research to support ocean governance, as well as to discuss the future role of science for the implementation of the 2030 Agenda for Sustainable Development. Action Platform for Source-to-Sea Management (S2S Platform) - A multi-stakeholder initiative that draws upon its members to generate knowledge, exchange experiences and provide guidance to policy making and implementation to address priorities from source to sea. Only in the last couple of years, marine litter has been broadly recognized as a problem that must be taken seriously. The recognition throughout the whole of society, significant scientific evidence, a remarkable amount of goodwill present, as well as clear and substantial political backing have formed a global understanding and unity that justifies hope for the sake of the marine environment. Much has been done on national, regional and international level and work continues. Challenged with a sometimes difficult process to provide a smooth transition in terms of implementation from theory to practice, the event addresses governmental and non-governmental experts and will provide a platform to discuss and possibly demonstrate on how such transition may be successful and how theory and practice can mutually support and complement each other. World Oceans Day is an annual global reminder to honor, protect, and conserve the worldâ€™s oceans. Officially recognized by the United Nations in 2008, the UN initiates and supports various activities led by the UN Division of Ocean Affairs and Law of the Sea (DOALOS) each year on June 8th. This year, the United Nations in New York celebrates World Oceans Day with a special event in celebration of World Oceans Day, co-organized and sponsored by Parley for the Oceans. The three-hour show will raise awareness for the beauty and fragility of the oceans and highlight the most promising initiatives to reverse their decline, focusing especially on the power of creative collaboration and eco-innovation in the successful realization of SDG 14. Features include talks from world-renowned ocean experts and explorers, representatives from coastal communities, and voices from current and future generations. Secretariat of the Convention on Biological Diversity; FAO; UN Environment; Global Ocean Biodiversity Initiative; CSIRO/Australia; Duke University/USA; Convention on Migratory Species, etc. Can we achieve sustainable economic development on land and in river basins while reducing the negative impacts on coastal and ocean ecosystems from land-based activities? This side event will showcase experiences dealing with resource flows from â€œsource to seaâ€�. The ambition is to learn how source-to-sea measures can be supported by nations and regional organizations in a broader economic perspective to achieve SDG 14. The Governments of Belize, St. Vincent and the Grenadines, Norway, Iceland through the the United Nations University â€“ Fisheries Training Programme, the Caribbean Regional Fisheries Mechanism and the Caribbean Community Secretariat are pleased to present a unique cross-regional partnership that has contributed to strengthening governance and management of fisheries and aquaculture, combating IUU fishing, improving trade capacity and knowledge base for planning and decision-making, and building human and institutional capacity for conservation, management and trade and development. The side event will feature presentations from government, civil society, and academia and will provide best practices from the Caribbean region, highlight critical gaps and needs, and announce partnerships. Kingdom of Tonga, Mexico, International Seabed Authority, UN DESA,nd with the support of TOML/Nautilus Minerals Ltd.
Oceans cover more than two-thirds of our planet. They are rich in resources and provide people with food, energy, and a stable climate. Nevertheless, the future of these unique ecosystems is endangered by overfishing, loss of biodiversity and marine pollution. The Ocean Atlas 2017 is an educational tool that provides facts and figures on the importance of our marine ecosystems and the urgency of SDG 14. Join us for an expert panel discussion on World Oceans Day. Getting fit to do our bit! A range of capacities are required at different levels to work towards sustainable ocean governance. In this side event, capacity development formats ranging from formal education on- and offline, to customized courses and leadership training for decision makers, are introduced with examples of their applications. In group work, options for capacity development to match specific challenges will be discussed. Over 30 children/youth from UNESCO Marine World Heritage sites will call upon world leaders to sign a pledge to protect the ocean for future generations. Youth from UNESCO Marine World Heritage accompany Ms. Irina Bokova, Director General UNESCO, Heads of State, and celebrities as they sign to pledge to protect our ocean. Media access available. The Blue Solutions Initiative facilitates the exchange of successful approaches in marine and coastal management and supports their uptake in new contexts. In this side event, it will showcase the approach to share, promote, and readapt solutions with examples from Australia, Brazil, the Seychelles, and Vietnam. Supporters may pledge a contribution to the implementation of adapted solutions in new settings. The Bright Spots event is a dedicated effort to surface, analyze, and widely share innovative and replicable community-based marine conservation and small-scale fisheries solutions, which supports the implementation of SDG 14 and aim to address various SDGs issues of poverty, food security and climate change. This event provides the essential learning and leadership exchange that builds on the political and financial commitments that will be made during the Conference. The event aims to provide a stage for local communities to present their bright spots and celebrate and widely share them such that they can be replicated to enhance their impact. It will provide an opportunity to share best practice and learn from each other to replicate solutions that work. Many times, however, these solutions remain at the local level and go unnoticed by the international community. By invitation only due to limited space Sponsored by the Natural Resources Defence Council, the High Seas Alliance and Blancpain. The First Global Integrated Marine Assessment, which summary was approved by the UNGA, provides a stark picture of the current state of our oceans. Anthropogenic pressures on marine ecosystems, such as marine pollution, overexploitation of marine living resources, coastal degradation, climate change and ocean acidification, are challenging the resilience of the oceans and their resources, as well as their continued ability to provide important ecosystem goods and services to humankind. The UNGA has noted with concern the findings of the Assessment that the worldâ€™s ocean is facing major pressures simultaneously with such great impacts that the limits of its carrying capacity are being, or, in some cases, have been reached. Hacking science for Ocean Literacy: Whatâ€™s needed to fully implement SGD14? Arctic Ocean Resilience: Can critical tipping points still be avoided? Achieving the end of illegal, unreported and unregulated fishing to enable Developing States to increase their share of economic benefits from the sustainable use of highly migratory and straddling stocks in their own region. The Panama Canal, the great connection between seas & oceans: the intersectoral challenges in the implementation of SDG's. Science, society and sustainable development: unique science solutions to sustainably manage our rapidly changing seas and enhance future well-being. Radical Ocean Futures - Can we Save the Ocean using Science Fiction? The Ocean Conference will consist of a total of eight plenary meetings. The list of speakers for the plenary meetings will be established on a first-come first-served basis, with the customary protocol that ensures that Heads of State or Government speak first, followed by other heads of delegation. The European Union will be included in the list of speakers. At the opening of the Conference, to take place on the morning of Monday, 5 June 2017, consideration will be given to all procedural and organizational matters, including the adoption of the rules of procedure and the agenda, the election of the two Presidents of the Conference, the election of officers, the establishment of subsidiary bodies, as appropriate, the appointment of the members of the Credentials Committee, arrangements for the preparation of the report of the Conference and other matters. At the opening, statements will be made by the Presidents of the Conference, the Secretary-General of the United Nations, the President of the General Assembly, the President of the Economic and Social Council, and the Secretary-General of the Conference. The plenary meetings will also hear statements from representatives of other intergovernmental organizations, the United Nations specialized agencies, funds and programmes, as well as major groups and other stakeholders in accordance with the practices of the General Assembly. The closing plenary meeting, to be held on the afternoon of Friday, 9 June, is expected to conclude with reporting on the partnership dialogues, to be followed by the adoption of the â€œCall for Actionâ€� and of the report of the Conference. The Conference will also include seven partnership dialogues, to be held in parallel with the plenary meetings. The themes for the partnership dialogues will be considered at the preparatory meeting on 15 and 16 February 2017, on the basis of a background note prepared by the Secretary-General that will include a proposal for themes of the partnership dialogues. The background note will be available in January 2017 as official document of the Conference in all UN languages. The Secretary-General of the Conference will select a moderator and up to four panellists for each of the partnership dialogues. The panel discussions, facilitated by the moderator, will be followed by an interactive debate among States and other relevant stakeholders. The Secretary-General of the Conference will prepare, with the inputs from stakeholders, concept papers on each of the themes of the partnership dialogues, taking into account the relevant oceans-related processes of the General Assembly. The Conference will also include a special event commemorating World Oceans Day which will be held on 8 June, from 10 a.m. to 1 p.m.
organizations that have been approved for special accreditation to participate in the Conference and the preparatory meeting (for list please see this document). The seven partnership dialogues, an official part of the Ocean Conference, were interactive and multi-stakeholder in nature and focused on recommendations to support the implementation of Sustainable Development Goal 14, including through strengthened cooperation, building on existing successful partnerships and stimulating innovative and concrete new ones. They were open to all participants accredited to the Conference (States, intergovernmental organizations and other entities, associate members of regional commissions, the United Nations system and representatives of major groups and other relevant actors) and had designated seating. The partnership dialogues were presided over by two co-chairs at the ministerial level and above - one from a developing country and one from a developed country - and will be facilitated by a moderator. They began with a panel discussion and were followed by an interactive debate among participants. During the interactive debate, interventions were made from the floor. The order of speakers for each partnership dialogue were determined on a first-come, first-served basis, bearing in mind equitable geographical distribution while allowing for some flexibility with priority given to States according to the level of representation, followed by intergovernmental organizations and other entities, associate members of regional commissions, United Nations system, major groups and other relevant actors. The co-chairs of the partnership dialogues have prepared summaries, which were presented at the closing plenary meeting and included in the final report of the Conference. A list of voluntary commitments for the implementation of Goal 14, announced at the Conference, including in the partnership dialogues, and registered in the Registry, will be included in the report of the Conference. When presenting a pre-registered voluntary commitment during an intervention, the speaker should convey the â€œreference numberâ€� (for example: #OceanAction060517) to the Secretariat ahead of time. The related page of the Registry will then be projected on the screen above the podium during the intervention. The high-level United Nations Conference to Support the Implementation of Sustainable Development Goal 14: Conserve and sustainably use the oceans, seas and marine resources for sustainable development (informally, The Ocean Conference) was convened at United Nations Headquarters in New York from 5 to 9 June 2017, coinciding with World Oceans Day, to support the implementation of Sustainable Development Goal 14. The Governments of Fiji and Sweden held the co-hosting responsibilities of the Conference. The Conference was comprised of plenary meetings, partnership dialogues and a special event commemorating World Oceans Day. The Conference adopted by consensus a concise, focused, intergovernmentally agreed declaration - the "Our Ocean, Our Future: Call for Action"-- to support the implementation of Goal 14 and a report containing the co-chairs' summaries of the partnership dialogues, as well as a list of voluntary commitments for the implementation of Goal 14, to be announced at the Conference. The President of the General Assembly convened a two-day preparatory meeting on 15-16 February 2017 at UN Headquarters in New York, chaired by H.E. Mr. Alvaro MendonÃ§ae Moura, Permanent Representative of Portugal to the UN, and H.E. Mr. Burhan Gafoor, Permanent Representative of Singapore to the UN, the two co-facilitators, and considered the themes for the partnership dialogues and elements for a "Call for Action." Mr. Wu Hongbo, Under-Secretary-General for Economic and Social Affairs of the United Nations, was the Secretary-General of the Conference. Mr. Miguel de Serpa Soares, Under-Secretary-General for Legal Affairs and United Nations Legal Counsel, was the special advisor to the Presidents of the Conference on oceans and legal matters. Side events sponsored by Member States, the UN system and other intergovernmental organizations as well as Major Groups and other stakeholders, were organized at the UN Headquarters in New York in the margins of the official meetings of the Ocean Conference and its Preparatory Meeting to allow space for sharing experiences and provide alternative opportunities for dialogue. The side events were coordinated and managed by the Conference Secretariat. Side events were organized from 5 to 9 June 2017 in the margins of the Ocean Conference. For the programme of side events please click here. A report containing the co-chairsâ€™ summaries of the partnership dialogues, which focused on strengthening cooperation, scaling up and replicating existing successful initiatives and launching concrete and new partnerships that will advance the implementation of SDG 14. More than 1,300 voluntary commitments for the implementation of Goal 14 were made by governments, businesses, civil society and other stakeholders. For the compilation of the List of Participants to the Conference, representatives of States participating in the Conference, the European Union, intergovernmental organizations and other entities with an office in New York, and specialized agencies and related organizations are kindly requested to communicate the composition of their delegations to the Secretariat starting from 30 May 2017. Please be informed that the composition of delegation for the Conference should be submitted via the e-deleGATE electronic portal (https://delegate.un.int). Access to the Conference e-List of Participants will automatically be granted to users that already have access to the Protocol eAccreditation system and the General Assembly plenary e-speakers portal. Please be advised that the Conference e-List of Participants portal will be available from 30 May 2017 until 23 June 2017. Additional questions regarding the Conference e-List of Participants should be directed to the Secretariat (Mr. Jonas von Freiesleben (e-mail freiesleben@un.org). Representatives of intergovernmental organizations accredited to the Conference without an office in New York, associate members of regional commissions and United Nations organs are kindly requested to communicate the composition of their delegations to the Secretariat (Ms. Lourdes Quiogue (e-mail quiogue@un.org)). Governmental and non-governmental stakeholders planning to participate in the Conference must be accredited to the United Nations for registering to this process. The following participants may attend or be represented: States Members of the United Nations, members of specialized agencies and parties to the United Nations Convention on the Law of the Sea; intergovernmental organizations; associate members of regional commissions; United Nations system; non-governmental organizations and major groups as well as other relevant stakeholders; and Media. To obtain UN grounds pass, permanent missions in New York may submit their requests via the online accreditation system â€œeAccreditationâ€� at http://delegate.un.int. Information regarding the â€œeAccreditationâ€� system can be found at http://www.un.int/protocol. Please click here to download a complete list of the IGOs that can participate in the Ocean Conference. (A) United Nations accredited IGOs and entities with an office in New York may follow the same procedure for member States via the online accreditation system â€œeAccreditationâ€� at http://delegate.un.int. They should also notify the United Nations Protocol and Liaison Service of their participation in the Conference. A letter signed by the head of the organization with an official seal containing the names and functional titles of the delegation should be sent to the Protocol and Liaison Service mentioned above. (B) United Nations accredited IGOs and entities away from New York and already enrolled in the online accreditation system â€œeAccreditationâ€� may follow the same procedure specified in (A) above. Submit a letter to the Chief of Protocol, stamped/sealed and signed by the head of the organization, with the names and functional titles of the delegation attending the meeting. In addition, the letter must include a name and an email address of the focal point of the organization handling the request. A copy of this letter should also be sent to the General Assembly Affairs Branch/ Department for General Assembly and Conference Management (Secretariat of the Conference, Att. Ms. Radhika Ochalik, email: ochalik@un.org). Send both (i) and (ii) to the Protocol and Liaison Service at Room S-0201, by fax to 1-212-963-1921 or by email to unprotocol@un.org. Other IGOs interested in obtaining an ad hoc accreditation for the United Nations Conference to Support the Implementation of Sustainable Development Goal 14: Conserve and sustainable use the oceans, seas and marine resources for sustainable development (5 to 9 June 2017) can submit an application addressed to the President of the General Assembly. Interested IGOs are invited to send a letter from the head of the organization on official letterhead (with the original signature) addressed to the President of the General Assembly requesting for ad hoc accreditation to the Conference and describing the work of the organization related to the Conference objectives; provide copies of the organizationâ€™s establishing agreement (a formal treaty or other legal instrument); provide information on the membership of the organization; and submit the latest annual report. Upon review of the applications by the Secretariat, the applications will be forwarded to the General Assembly for its consideration. Kindly note that the deadline for ad hoc/special accreditation of IGOs closed on 15 May 2017. No applications can be accepted at this time. Only after the approval by the General Assembly, the representatives of the newly accredited IGO will be issued a UN-ID Pass in accordance with the same procedures highlighted in para (C) for IGOs without an office in New York. Representatives of associate members of regional commissions (American Samoa, Anguilla, Aruba, Bermuda, British Virgin Islands, Cayman Islands, Commonwealth of the Northern Mariana Islands, CuraÃ§ao, French Polynesia, Guadeloupe, Guam, Martinique, Montserrat, New Caledonia, Puerto Rico, Sint Maarten, Turks and Caicos Islands, and United States Virgin Islands) are required to follow the same accreditation procedure highlighted in para (C) for IGOs without an office in New York, for issuance of UN-ID. Specialised agencies and related organisations: The registration of the representative of the Specialised agencies and related organizations of the UN system (ILO, FAO, UNESCO, ICAO, WHO, World Bank, IMF, UPU, ITU, WMO, IMO, WIPO, IFAD, UNIDO, IAEA, WTO, UNWTO, CTBTO, ICC, OPCW, ISA, ITLOS and IOM) follows the same procedures as for states and IGOs and other entities with observer status with the General Assembly for both the preparatory meeting and the Conference (UNHQ, New York, USA). Please click here for information on NGOs and other Major Groups organisations. Media accreditation is strictly reserved for members of the press: print, photo, radio, television, film, news agencies, and online media who represent a bona fide media organization. Missions in New York may submit requests for media accreditation, including for official photo and video, via the online accreditation system â€œeAccreditationâ€� at http://delegate.un.int (please select Media from the Capacity pull down menu). Photographers and camera operators will be escorted to various conference rooms from the Media Accreditation and Liaison Unit's office, S-250. 24 March: Stakeholder Dialogue on a "Call for Action"
The Ocean Conference will take place at the United Nations Headquarters in New York. 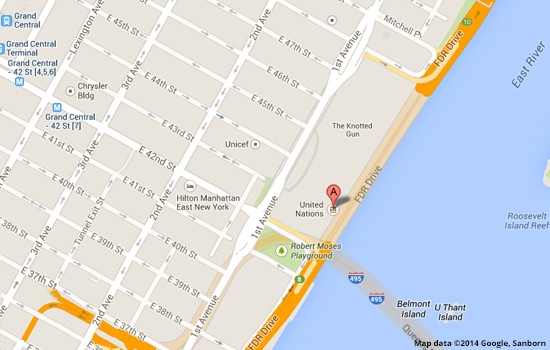 The United Nations Visitors Entrance is at 46th Street and 1st Avenue, New York, NY 10017. The United Nations Headquarters is located in the heart of New York City on 1st Avenue between 42nd and 48th Street. We would like to encourage all participants to use reusable bottles. Please click here to download a map of the UN building which includes Conference Rooms, bathrooms, water fountains and other facilities. All entrances, public restrooms, routes and exits are wheelchair accessible. The Ocean Conference aimed to be the game-changer that will reverse the decline in the health of our ocean for people, planet and prosperity. It was solutions-focused and called for the engagement of all relevant stakeholders, bringing together Governments, the United Nations system, other intergovernmental organizations, academic institutions, the scientific community, the private sector, philanthropic organizations, civil society, mayors, children, youth and others who will utilize this momentum to galvanize action-oriented partnerships at all levels -- local, regional, national and global -- that will provide lasting and long term solutions. Date and venue: 5-9 June 2017, UN Headquarters, New York. The Conference week kicked off with World Environment Day (5 June) & integrated a major World Oceans Day celebration on 8 June. Theme: "Our oceans, our future: partnering for the implementation of Sustainable Development Goal 14"
Format: 8 plenary meetings, 7 partnership dialogues, and a special event commemorating World Oceans Day. The "Our Ocean, Our Future: Call for Action," a concise, focused, intergovernmentally agreed declaration to reverse the decline of our ocean. Co-chairs' summaries of the partnership dialogues, aimed at strengthening cooperation, scaling up and replicating existing successful initiatives and launching concrete and new partnerships that will advance the implementation of SDG14. Raising Awareness: The Conference provides significant potential to raise awareness on the importance of the Ocean and implementing SDG14. Meaningful events that complement the Conference that enhance global attention and action are encouraged, including side events in the margins of the Conference and the preparatory meeting, media and social media engagement, such as the SDG media zone or press conferences and exhibitions at the United Nations during the conference.